What Ever Happened to Once Upon a Time? The middle school drama elective, after eight weeks of practice, performed “What Ever Happened to Once Upon A Time” during March is Reading Month. “ It was a team effort. This group of twenty-three sixth, seventh, and eighth graders chose a play, auditioned for parts, honed their characters, and created costumes and props. They were very concerned with the authenticity of their characters, asking many questions as to how they should act or say certain lines. This was a very dedicated group of kids,” Mrs. Zimelis stated. The play began with four substitute story tellers who were each excited for his/her first day on the job. Having grown up loving reading and listening to fairy tales themselves, they could not wait to share their enthusiasm for these beloved classics with other children. Their enthusiasm quickly turned to dismay as they encountered a forgetful royal family, pigs with asthma and bad backs, a wolf more concerned with winning a Tony award than finishing a fairy tale, and other wacky, misguided characters from many of their most beloved classics! “ I think we all felt that way, “ replied Morgan A., another story teller in the performance. “ What I really enjoyed was working with everyone, and I liked being the character that I was. As the king, I was supposed to be forgetful and clueless, “ commented Aidan M.
Ideas are already being batted around for next year. “ We should write a play about all the holiday characters, you know, like the Easter Bunny, Santa, and a leprechaun all getting together to create a new holiday, ” suggested Jessica M. Who knows? It may happen! Mr. Kress’ 4th grade class recently experienced, first hand, the value of perseverance as they worked through a complicated science project. In order to deepen their understanding of the transfer of energy and motion, the class was assigned a Rube Goldberg project. The goal of the project was to create a chain reaction of household objects in order to accomplish a simple task. The students were not given specific rules for what task to accomplish, what objects to use, or how big the project had to be. After watching a few examples and brainstorming ideas, each group was responsible for planning their project, bringing in the proper materials, and building and testing the final machine. It was a long week for many groups of building, rebuilding and tweaking their designs until they achieved success. In the end, the class learned about how energy transfers from one object to another, and they also learned valuable lessons about teamwork, growth, mindset and persistence. After the completion of the project, the students were given the opportunity to reflect on their experiences. Many students were able to connect our core values at ASA to this project. Their answers were most telling about what they took away from the experience. “I think my favorite part was the recording.” -Santos R.
“My advice would be that it may take many tries, but it will work.” -Cadan W.
“It was hard when things didn’t go right because we had to redo some parts.” -Makenzie M.
“I thought it was fun because we actually got to work together. It was also a learning experience.” -Hadrian S.
“It was cool to try to find a way to get the ball down the ramp.” -Grace E.
“We had to believe that All Things are Possible Through Christ because we had to believe that we would score.” -Tommy S.
“My favorite part was testing it because I got to have fun with my friends.” -Sierra G.
“The most difficult part was coming up with a plan because there were so many things to do.” -Emma B. “I would say to a future 4th grader that it will take a while and be very patient.” -Owen O. “The time when we first succeeded I felt a sense of accomplishment.” -Josh M.
“We had to believe All Things are Possible Through Christ because the Lord helped us on our third try.” -Brooklyn O. 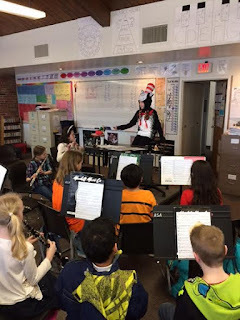 “I learned that teamwork can accomplish anything.” -Mei M.
We've been having a ball with reading at the elementary for March is Reading Month! We've read in our pajamas and dressed as our favorite book characters. We've Dropped Everything to Read and are literally covering our walls with balls! Mr. Debri has offered a reward of Debri Ball for all if we come together as a student body and read 1200 books. We are well on our way and boy are we motivated! This week we're enjoying a special snack while using technology to watch an online story. Next week we will Read Around the School, visiting various classrooms and hearing many special stories. We love good books here at All Saints Academy! All students will have the opportunity to take part in this book bracket by filling out a bracket based on their favorite book choice of the given titles. The winning books will be selected based off of student votes. up to interrupt and correct our newbie narrators telling of each story. from novels read from grades four through eight. games based on premiered books! And the middle school book bracket winner was...Green Eggs and Ham! The kids filled out book brackets much like the NCAA Basketball March Madness Brackets. Winners were determined by student votes. The matches were real nail-biters and even required an “overtime” where the outcome was determined by teacher vote! Middle School students, Owen L, Jonathan J, Noelle H, Leah O, Izzy S, and Bridget F had thirteen out of sixteen correct picks, and Meagan J and Max H had twelve correct picks. Those bookworms enjoyed gummy “book”worms as a reward for their expertise! In 2012 Hanover Research confirmed what has been a practice at ASA over the years and is aligned with the competencies of the comprehensive school counseling program established by the American School Counselor Association, career exploration and awareness is critical for career and college ready high school students. Our fourth graders did this with style with the seventh annual career wax museum. The students learned about Michigan’s Six Career Pathways and surveyed themselves to see which pathway that they are currently aligned. It was fun for them to see how their hobbies and interests matched up to the different pathways. During the wax museum they were able to show off their poster presentations and shine with their sharpened public speaking skills for the museum goers, students in preschool through third grade, staff, family and friends. Way to go fourth graders and thank you to the parents for their support of this learning opportunity! Prior to fourth grade learning, students at ASA develop career awareness as early as Kindergarten! In third grade we spend more time developing career choice awareness. The third graders joined the fourth grade in a game of career bingo. This was a fun way to develop awareness of many careers. The third graders also enjoyed listening to the story written by Al Yankovic, When I Grow Up. This introduced to them that there are many options to choose from while then having the opportunity to teach their classmates about a career with a pair-share activity. LMNO Peas by Keith Baker, is a creative, fun story which helped our kindergartners begin to think about a variety of careers from A to Z. After the book was shared the students had a chance to color a letter representing one of many career opportunities! Our first graders shine knowing their future looks bright….Our first graders guessed the chosen career represented on sunglasses and had the opportunity to share how their future will look bright as they shared what they want to be when they grow up! Oh, the Places You’ll Go! These wise words from Dr. Seuss helped guide our second graders through a great story and message. The message supports all that career and college ready requires: resiliency, growth mindset, goal setting and, most importantly, opportunities! They are reminded they will continue to grow their brains, they will learn from mistakes, and they will succeed! They then had fun creating hot air balloons sharing what they want to be when they grow up! Providing exposure to career choices, and the skills and preparation necessary to successfully obtain these careers, provides students the foundation needed to be self-aware regarding who they are and an opportunity to develop goal setting skills so that they can plan for who they strive to become as adults. At ASA, we believe this process should begin with the students in kindergarten and continue with this through their middle school years. Throughout the grades, we integrate the activities with the standards to create an interdisciplinary approach to career awareness. Collectively, we are providing students the opportunity to get a leg up on their vocation, career, and/or college choices.